For many people, finding out which mobile operator has the best signal in their area can be a real pain and involve lots of time to check each operators coverage maps or (and it's probably far more likely) involve various discussions with friends and neighbours to find out who uses who and how they get on. To try to make life easier, and to give an independent perspective to the issue, Ofcom have recently launched an on-line tool to help people around the UK determine what levels of mobile phone signal they should be expecting in their area. The coverage map was created based on data from the UK's leading service providers as well as the watchdog's signal tests around the country. It measures call quality and data connectivity both indoors and outdoors for each area, along with geographic variables such as valleys and hills that could affect signal strength. 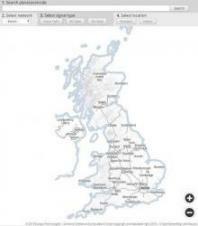 Users can search for their local area by entering their postcode or zooming into an area on the map. "Access to reliable mobile phone coverage used to be a 'nice to have'," said Ofcom's chief technology officer Steve Unger. "Now it's essential to many people's lives." Ofcom is seeking community feedback to help improve the accuracy of the service, asking users to get in touch if their coverage is significantly different to the map. HTML5 validated. WCAG compliant. Page generated in 0.0701 seconds.